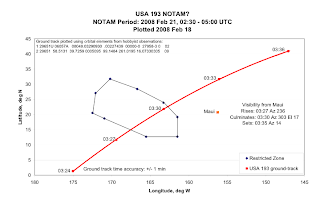 The US-193 satellite has been officially scheduled for destruction on February 21st, 2008 at 03:30 UTC. The satellite will be shot down near Hawaii, in restricted airspace over the Pacific Ocean to avoid debris reaching land. US-193 had lost power and communications a while ago, and its orbit has been decaying since. So if you're on the West coast, keep an eye out at this time. More information on US-193's destruction is available here. Here on the East coast, we probably won't be able to see the event, but we might get to see the debris field. Also notice that the destruction of this satellite falls in line with the upcoming lunar eclipse. Probably a pure coincidence, though. Ground track during US-193's destruction. We solo want to find out more about great content creation by way of this web site any kind of help is extremely a lot valued. You can now additionally follow-up Cash Advance Many thanks with regard to good work continue the good work.